For the past few months, my son has been showing a lot of interest in my baking. He was excited when he first saw this recipe from the book, "B" is for Baking by Sesame Street, Susan McQuillan and I can tell that he really want to bake these muffins with me. Since I need "assistance" for my Christmas baking, I thought I might as well start training him... LOL! The recipes in this book, "B" is for Baking are designed in the way to encourage kids to bake and eat healthy foods with lots of wholegrain, fresh fruits and vegetables. 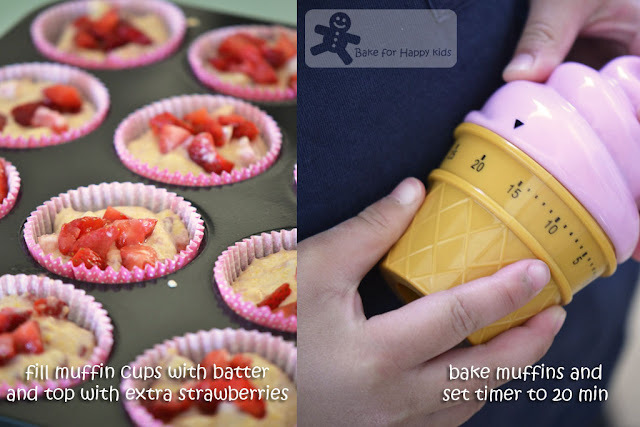 Each recipe indicates steps that will allow kids' participation so that they will be proud of their own bakes and eat them all. 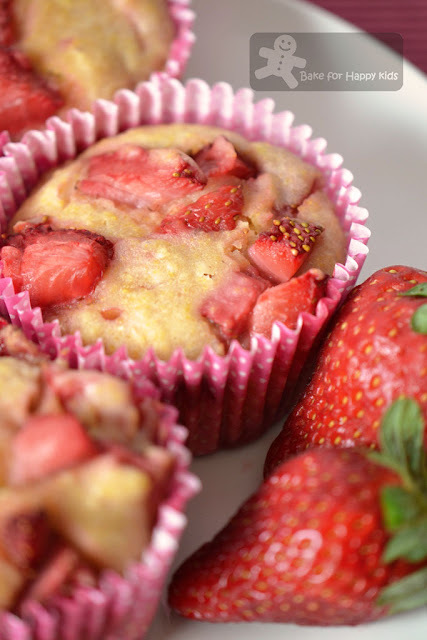 These muffins are not sweet at all and the recipe can be versatile too by replacing the strawberries with peaches, nectarines or other berries in season. My three year old boy and I were like a tag-team baking these muffins. We really enjoy baking together and will bake more as a mummy-and-son team in the near future. Based on the muffin's name, I would think that these healthy muffins will be disappearing fast in our house but they didn't. As these muffins are low fat and really not sweet at all, my husband and I didn't feel like eating much of them. In fact, my son was the one who ate most of the muffins eventually as he didn't want to waste his efforts of baking these muffins. I guess the book is totally right in this kiddy concept and mindset of baking... LOL! ... and happy to watch them disappearing! They all went into a little boy's tummy. Preheat the oven to 400°F (or 180°C fan forced). Line 12 muffin cups with paper or foil liners. In a large bowl, use a rubber spatula to stir together the yogurt (buttermilk) and oil, then stir in the egg until well-blended. Stir in the flour mixture just until mixed. 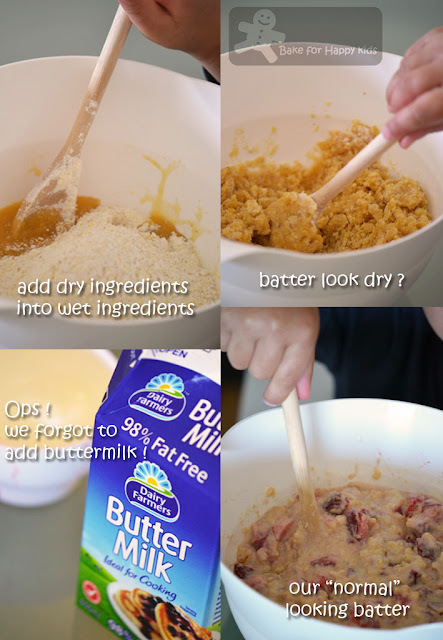 (We forgot to add buttermilk before this step and so we added the buttermilk after stirring in the flour mixture.) Fold in the strawberries. Bake for 20 to 25 min or until a toothpick inserted in the center of one muffin comes out clean. Transfer to rack to cool for a minute or two. Turn the muffins out to cool further. Wow! such a good team work! My son is 3 too, I enrolled him in 'Chef-R-us' program, surprisingly he enjoyed the food that he wouldn't eat if I were to prepare at home! looks like they enjoyed the hard work of their hands! haha! 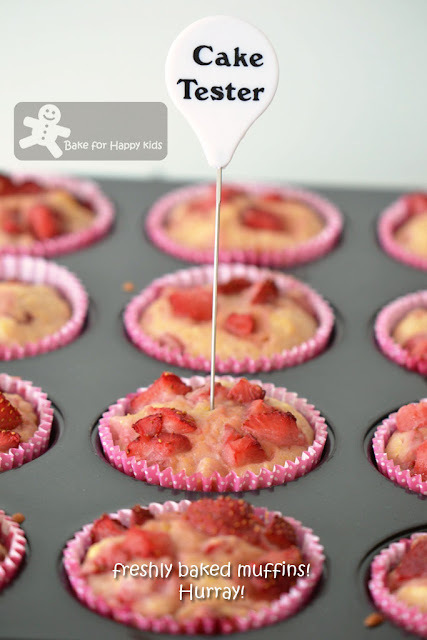 The muffins looks great with strawberries and pink cupcake casing. But most of all is the main actor..LOL your 3 years old boy. I bet he is really excited to bake this with his mum(tag team..^^) and both of you have done a great job. I do agree, when kids are proud of their own bakes, they will eat. 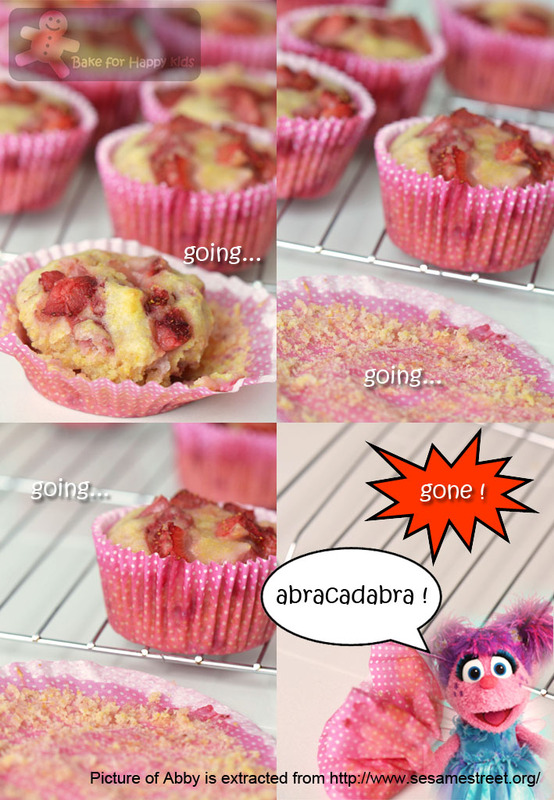 Wow Zoe, nice muffins, I love the big chunks of strawberries in it...so pretty and flavorful! Zoe, I would have thought that you will only buy blue muffin cases as you have a son, hahaha! If I bake healthy muffins, my son won't like it that much & my hubby & I have to finish them ourselves! 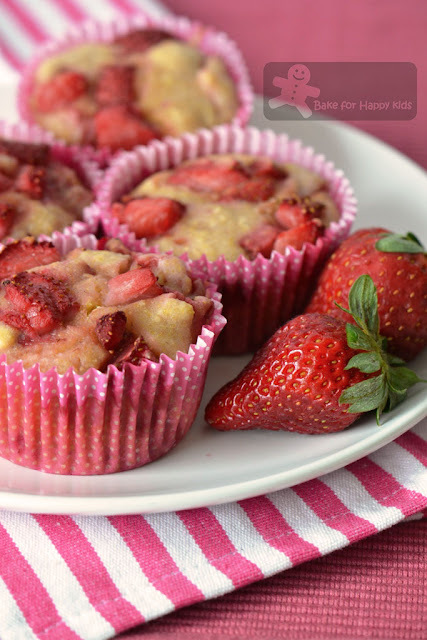 These strawberries muffins sound like a great recipe to me! Zoe, look absolutely delicious and I LOVE YOUR TIMER!! SO CUTE!! I love strawberries, so these would definitely disappear in my house! My Little Taz said Yummy for my Tummy Mom! Looks like we will be trying this soon. Hi Zoe, Such cute little fresh muffins. Simply loved the ice cream shaped timer. And boy what an amazing help you have in your kitchen..great job mum+boy !! Yes....I enjoyed scrolling down looking at your photos for this post. Beautiful....because I loves the red, I loves the strawberries the most ! Isn't it fun to have some helper in the kitchen? Hopefully as he grow along he still likes being a helper to you....you know lah boys usually dont like cooking! Wonderful! Zoe, baking with your little boy! The muffins looks great. He must be really proud of his efforts! I bet that he has already planned what he is going to bake next! Keep them coming! So nice looking. I like the oatmeal as one of the ingredients. Strawberry will make it taste a bit soury sweet. Lovely baked, Zoe. A very sweet post, both from the strawberries and the mother and son teamwork! Love it! Zoe, the muffins are gorgeous! Very nice that your son baked with you. Way to go little guy! If your son loved them, then I guess the psychology worked. That's great you are teaching him to bake so young. You are so smart to get the children into cooking/baking. This will stay with them forever. I know, i have 4 sons who are all good in the kitchen. Thank you for your welcome. Good to be back. What a taste of Springtime and how wonderful that your son has helped all along the way to snacktime! I can't believe Christmas is so soon, and the year is almost over. Time does seem to fly, doesn't it? Anyway, really nice recipe and what a fun time baking with your buddy. I love the "boy" and "mum" pictures! Soon you'll have your son trained so they'll all say boy! Good stuff- thanks. I can't wait till my son can cook with me! Awww....straberries, my favourite! What a beautiful muffin! 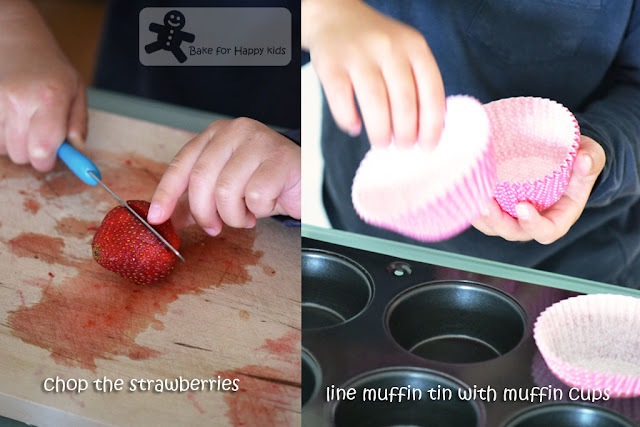 What a great way to introduce kids to food, the cupcakes look very delicious! these look so fun and yummy! and i totally love your timer!! Hey there. Thanks for dropping by my way! Is it really only 6-7 weeks left before Christmas??!! I need to get organised! A great way to start them young, Zoe. I see that your son has the potential to be the next Master Chef Jr..great looking muffins. soon you will need to get an apron for your son! at least he appreciates his own efforts and eats the muffins. Waste not, good boy! a great way to bond :) also to encourage kids involvement in the kitchen, my kids would love that!